I’ve been massively craving greens lately—kale, broccoli, and asparagus have been my favorites—but spending quality time in my kitchen has been on the back burner the last two weeks. To balance out lots of evenings spent away from home (when satisfying greens aren’t always the most convenient), I’ve been trying especially hard to get my fair share of vegetables in before dinner. 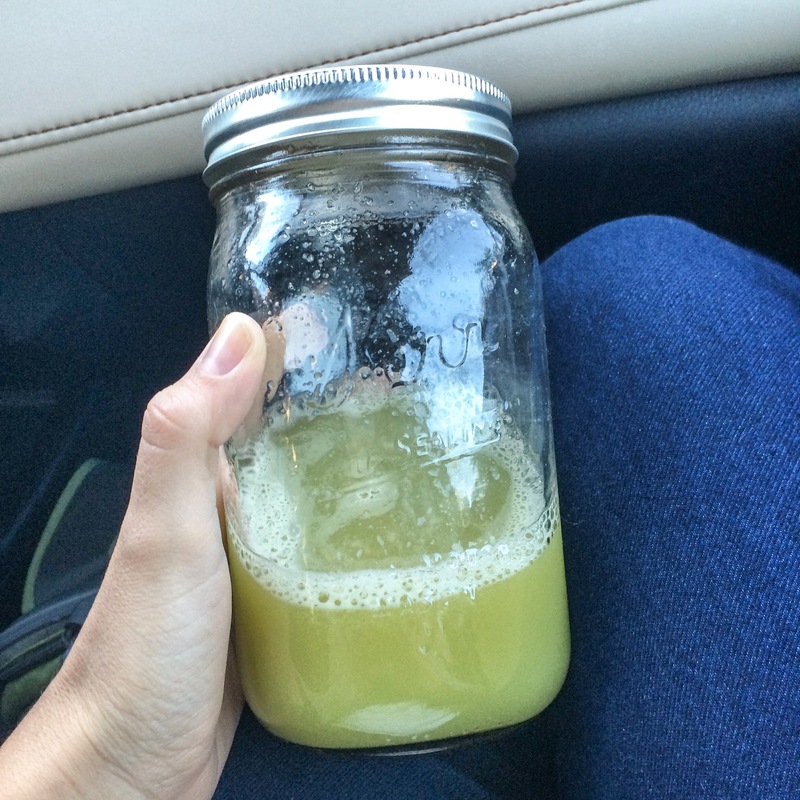 Green juice to the rescue! While I don’t like missing out on the fiber I’d get by eating my veggies whole, I personally feel invigorated after gulping a glass of green juice and find it to be a suitable substitute for healthy eating (errr sipping) on the go. This juice recipe doesn’t taste “green.” In fact, it has a sweet, spicy, citrusy taste because of the apple, lemon, and ginger (an always winning combo). 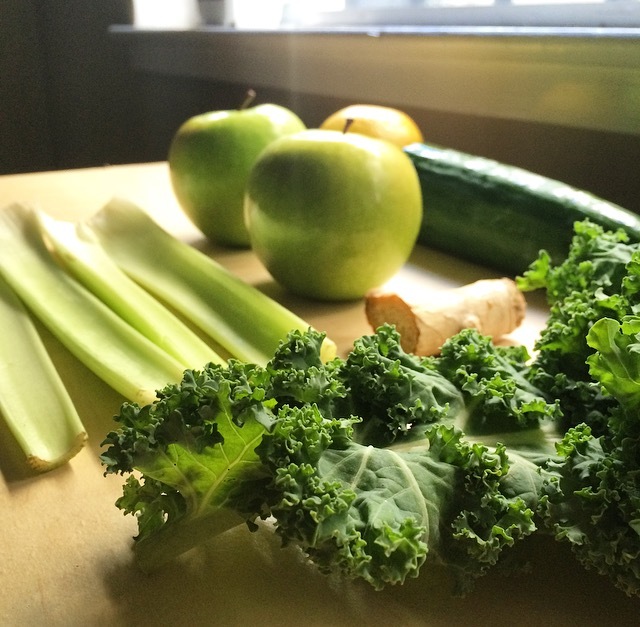 I try to drink my juice within 12 hours of juicing, but it should stay good for up to a full day if stored properly. Also note, this recipe makes two servings, because I always make enough juice for myself and Michel. Feel free to half it for a solo serving, or just make two and have one for breakfast and one for an afternoon pick me up. How do you balance out busy evenings away from home when cooking a veggie-loaded dinner isn’t an option? Do you make your own juice too? Have any favorite recipes? JUICE! (Hint: put the apples through last for best results.) Pour into a glass and serve. Feel like something a little thicker? Try my favorite green smoothie recipe instead! I hope you enjoy this recipe just as much as this sweet cat is enjoying her nap. Subscribe to the Weekly Cook Slow, Run Fast Newsletter! I love playing in the kitchen, exploring new and favorite places on long runs, frequenting the gym, and eating my way through different cities. Cook Slow, Run Fast is a place for sharing my passion for food, health, fitness, travel, and other things that make me happy. Spent this past weekend hanging out in the middle of some really old and beautiful trees. When you've realized you've ran 18 trail miles over the course of the weekend, and you're COMPLETELY exhausted (and slightly delirious), but you know that food is in your future. A weekend of hiking and Shakespeare in Ashland, Oregon makes for a happy heart. Did a 8-mile hike up to Eagle Peak in Mount Diablo State Park today! We hiked a total elevation gain of 2200 feet, enjoyed the sun and beautiful wildflowers, and even encountered a bobcat on the trail! I can't wait to climb the summit at some point - on a much cooler day, of course.